Looking for the website of an earlier edition? 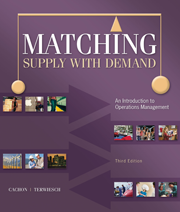 This is the official website for the third edition of “Matching Supply with Demand: An Introduction to Operations Management” (McGraw Hill, 2011) by Gérard Cachon and Christian Terwiesch, the Wharton School, University of Pennsylvania. Instructors, if you need a user ID and password, please register online. All new accounts are subject to approval. Table of sample materials. Read the Preface and Acknowledgements.